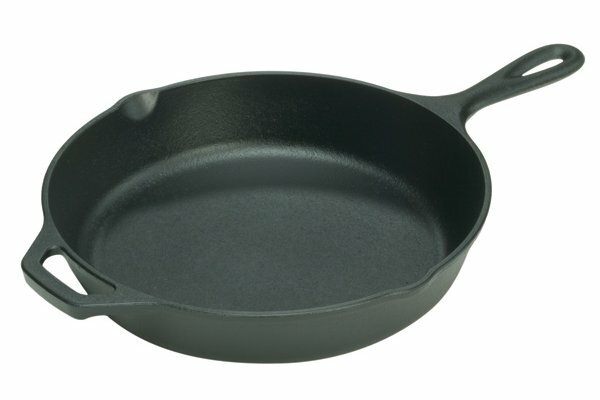 I have a 12 inch cast iron skillet which I love but I hesitate to use because it is heavy. It is also not easy to take out of its designated storage place. It seems like too much, usually, to use. Tonight, I was happy to do that. It always amazes me how when I am tired, something like this is overwhelming. The lure of this German Apple Pancake pushed my hesitation aside. I lugged the pan out and once it was on the burner, I knew, I could leave it there until my husband came home when he would move it to the oven. For, what I consider an ugly pan, it seems to perform miracles. A side story. When I was a newlywed, we were given some cast iron pans which I never used. Finally, I gave them away. I considered them ugly, heavy and of no use. Little did I know that cast iron pans cook like a dream. How foolish youth can be. It is easy to maintain. So far, everything, I have tried, cooks in it beautifully. If I needed to hit someone on the head, my weapon would be right at hand; that is if I could pick it up. That is humor, in case someone believes me. This is one to make again. If you like pancakes, I think you will like this super-sized pancake, filled to the brim with apples and sweetness. I have been searching the Internet to find where I got the recipe and so far have had no luck. I am planning to look again. I would like to give credit to whoever created this delicious pancake. In a large mixing bowl, combine the beaten eggs, milk, flour, and vanilla, and whisk until just blended, being careful to not overmix. Set the batter aside to rest at least 20 minutes. In a heavy ovenproof 12-inch skillet, melt 2 tablespoons of the margarine over high heat. Add the apples, cinnamon, nutmeg, and salt and cook, stirring frequently, until the apples are soft and lightly golden around the edges, about 6 minutes.Add the brown sugar and cook, stirring, until the apples are caramelized and soft, 2 to 3 minutes longer. Add the remaining tablespoon of butter and stir to melt. Working very quickly, pour the batter evenly over the top of the apples. Using oven mitts or pot holders, transfer the skillet to the oven and bake until the pancake is golden brown and puffed, about 15 minutes. Don't be alarmed when you see the edges of the pancake puff up over the top of the pan--this is supposed to happen! 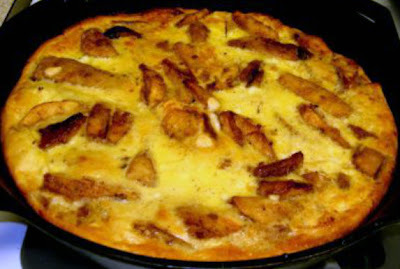 Your German Apple Pancake looks good! How I wish to have a cast iron skillet. They are extremely expensive over here!